Reprinted from Getting Smart, December 6, 2016. 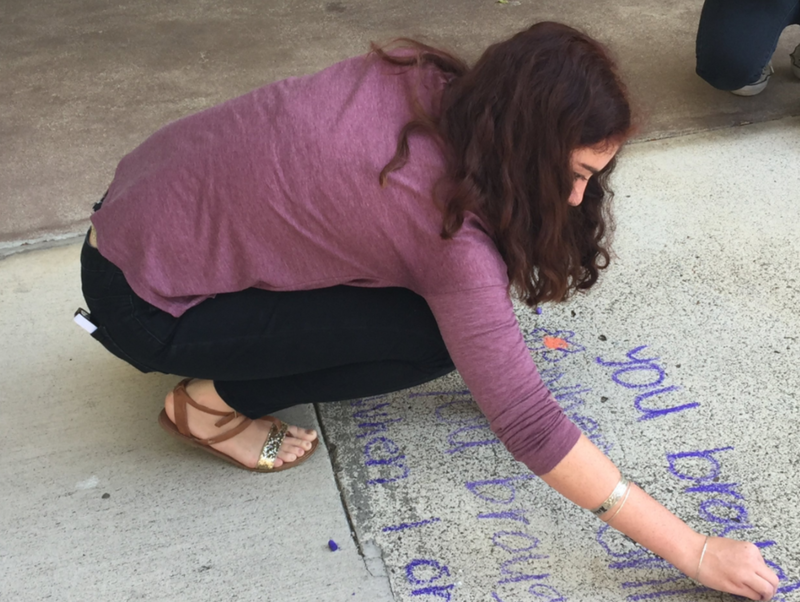 Students can choose favorite "sidewalk" poems to share for National Poetry Month. You’ve all heard the “yeah-buts” about differentiated or personalized instruction. If you hear these comments or complaints from peers, or even inside your own head, Amber Chandler’s The Flexible ELA Classroom will help you find your way towards a pedagogy that you want to believe in–because you are a teacher who has dedicated heart and soul to helping students learn. Not only that, but Chandler’s empathy for the personal struggles that teachers undergo, paired with the practical advice, organized materials, and effective strategies that can help you succeed, will make the shift towards personalized instruction easier than you think. Chandler structures her book around her own journey towards deeper differentiation in her classes. The first step: listening to students and giving them options and choice to “have a say in their own learning.” She describes how choice boards and menus in any discipline can allow students to express their understanding in ways that capture their interest or work best for them. Once you’ve gotten your toes wet and start to see the positive impact of giving students agency, you can apply these strategies more broadly by employing choice for action research projects or menus for independent reading–in any subject! Chandler describes how to teach students how to choose for themselves and the importance of giving them practice in a safe space, and she provides guidance for grouping students into teams for ongoing support, following a passion and probing deeply. She provides thoughtful strategies for vocabulary study, helpful for any teacher who has grappled with the best ways to tackle language acquisition, and uses the confidence students gain from word mastery on their own terms to lead into more challenging independent or group projects. Chandler ends with a thorough discussion of assessment, a sticking point for many, and some great advice for building family partnerships to help teachers get to know each student individually and thus help them grow as in a culture of learners. My only suggestions are that Chandler might push her assessments to be even more authentic by suggesting projects that have a real-life or global context outside the classroom, along with including more examples that are not so gender-based (ie., about gaming and directed at boys, or about fashion and directed at girls). Chandler returns to the point, again and again, that teachers should build their assessments around the skills or content that they wish their students to learn. Traditional essays assigned to everyone may be a useful and “fair” way to assess particular essay writing skills, for instance, but they may not be the best or only way to assess a student’s understanding of a literary encounter or theoretical concept. Chandler also believes that students need to learn a variety of ways to express their learning, including the usual tests and papers that they will continue to encounter in high school and college, along with the digital communications and media they will be immersed in for the rest of their lives. Don’t assume that The Flexible ELA Classroom is not for you just because it is rooted in Chandler’s practice as a middle school teacher of language arts. Her personable and practical approach can be applied to older or younger students, inform a range of disciplines outside language arts, serve the needs of public or private schools and really help anyone who deals in discipline-specific vocabulary, reading, presentations or projects. Likewise, it gives valuable advice for even the most experienced teacher who understands the need to empower his or her students and to partner with their parents–all in the service of learning. And not only does she give you the detailed scaffolding and planning advice anyone tackling differentiation might need, but she makes additional eResources available to you via the publishers, Middle Web and Routledge, as well as the book’s website.